The Open Knowledge Foundation, a UK-based non-profit organization promoting open access, has published a short guide to help people find public domain items online. This short guide offers an overview of what is public domain, where to find public domain works, and copyright licensing. Please share some of your own public domain sources on the web! DIY education, the new normal? 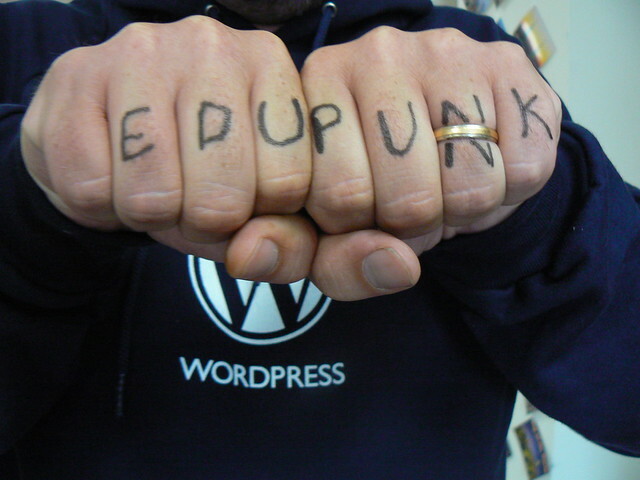 Edupunk is an approach to teaching and learning practices that result from a do it yourself (DIY) attitude. (source: Wikipedia). Photo credit: umwdltl on Flickr. I’m usually better than this at keeping up with social media and sharing fresh news. This one is a year old, but nevertheless worth sharing. This is in the true spirit of Anya Kamenetz best-seller DIY U. Kamenetz, a strong advocate of college affordability, was a keynote presenter at the EDUCAUSE conference back in October. She has also published a free book called The Edupunk’s Guide to a DIY Credential. My 2 cents on this is that even though being a lifelong self-learner is a critical to keep up and grow as a professional, I don’t think most of us in academia would agree that a degree awarded by a non-college/university accrediting body has the same value as a traditionally awarded degree. But is it only a matter of time before higher education loses its edge in public opinion to open the door to DIY graduates? In your mind, would that be a good or a bad thing? Can you think of ways to embrace this attitude in your own practice? Please share your comments or opinions below! The Saylor Foundation is a non-profit that focuses on making higher education free for everyone. The mission of the Saylor Foundation is to make education freely available to all. Guided by the belief that technology has the potential to circumvent barriers that prevent many individuals from participating in traditional schooling models, the Foundation is committed to developing and advancing inventive and effective ways of harnessing technology in order to drive the cost of education down to zero. This 13-minute video explains the principles and the process involved in Saylor’s vision to collect, vet, and distribute open content. In the video, Michael Saylor, Trustee of the Saylor Foundation, explains how networks are changing the game of learning. We have reached an inflection point were it is now cheaper to learn to read on a tablet computer than it is learn to read on paper. More people can access mobile networks in the world that can get access to running water. I believe this approach is pretty interesting. It definitely takes away the mistrust that some faculty members have regarding open educational resources. What do you think? 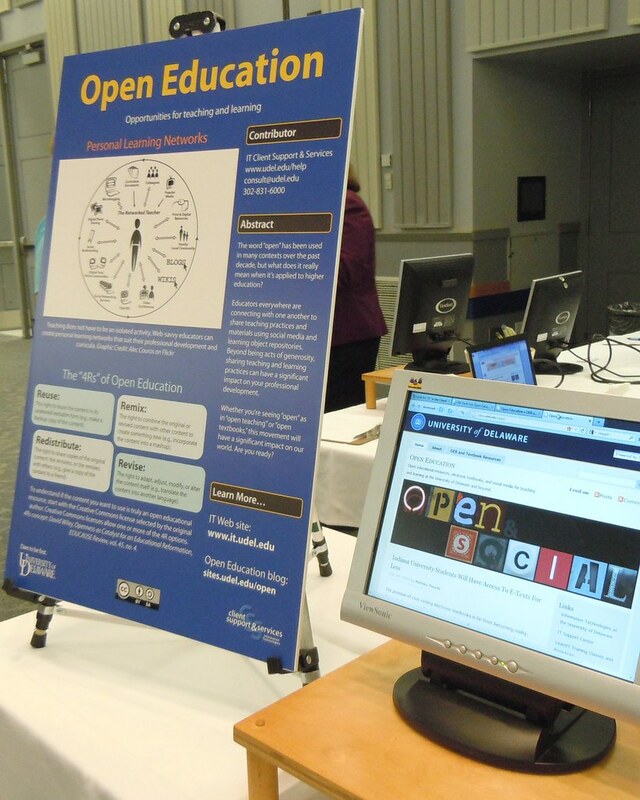 The second annual UD Tech Fair was held on October 19. This event showcased a vast array of IT products and services available to the UD community. The booth I was assigned to was called Open Education. My main goal was to raise awareness about open educational resources (OER), open textbooks, college affordability, and the professional development potential of teaching in the open leveraging personal learning networks. Most faculty and staff I had the chance of interacting with were very interested by the concept, and I was able to gather some names of people interested in giving open education a modest try. Out of all the conversations I had, two main points came up, and I’d like to use this post to direct readers to additional resources regarding those. Although everyone has a good idea that you con find almost anything on the Web, most attendees did not know about OER repositories. I have spent a significant amount of time simply navigation Connexions and Merlot, as well as discussing other state initiatives like the Open Course Library and the Orange Grove. Khan Academy also came up as a very promising STEM resource. I have created a page listing some of these resources on this blog, so feel free to explore at your own pace! 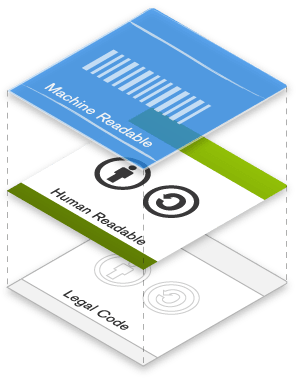 Creative Commons' Three Layers of Licences. Using David Wiley’s 4Rs of openness as a framework, I made a point to explain that making content available on the internet does not mean that it’s open. One of the ways to make sure you’re within your rights to use materials found on the web is to check if a copyright license has been applied to it, describing it authorized uses. 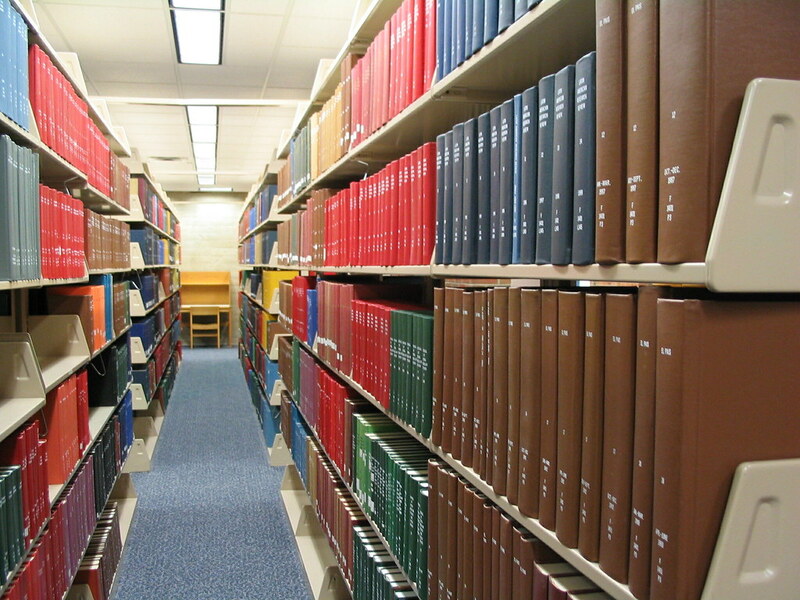 Creative Commons are the most widely used and understood copyright licensing processes. The creator decides which kind of license is assigned to work of his own, and with the chosen license comes attached all the legal uses (and legalese) for that work. I have addressed Creative Commons in a guest post on the UNU-ViE Learning Hub. If you’re interested in using or publishing open educational resources or open textbooks, please get in touch with me by sharing a story as a comment to this post or by contacting me directly by email (mathieu at udel dot edu). A recent article on the Guardian website by George Monbiot is making waves in social media. Monbiot claims that publicly-funded research should be available for free, not through expensive subscription or pay-per-article models. He also makes a point that the general public is kept out of the debate by those barriers. It’s bad enough for academics, it’s worse for the laity. I refer readers to peer-reviewed papers, on the principle that claims should be followed to their sources. The readers tell me that they can’t afford to judge for themselves whether or not I have represented the research fairly. Independent researchers who try to inform themselves about important scientific issues have to fork out thousands. This is a tax on education, a stifling of the public mind. It appears to contravene the universal declaration of human rights, which says that “everyone has the right freely to … share in scientific advancement and its benefits”. I’d like to get your opinion on this topic. Are publishers of academic journals the tyrants described by Monbiot? Would you be willing to only publish to journals who make the articles available online for free, or simply self-publish your own articles?